I’ve been hearing rumblings about Caravan for a while now. 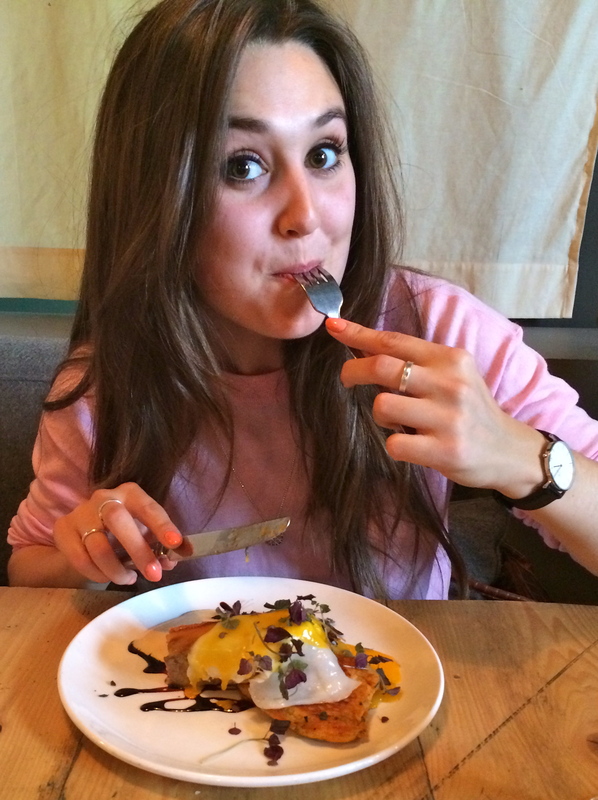 When I finally looked on their website and saw their exotic brunch menu, I just had to go and try it out! It has such an unusual selection of dishes that are so far removed from your average brunch choices. They have all of the more usual options of eggs and toast etc, however it was dishes like the pumpkin waffles and coconut bread with lemon curd that had me itching to come try it. It is located in an old grain store by King’s Cross, which is pretty cool in itself. There was a bit of a queue when we got there, so we were given a flour bag with our number on and told to grab a drink at the bar. I went for a soya latte- this is my absolute favourite drink at the moment! 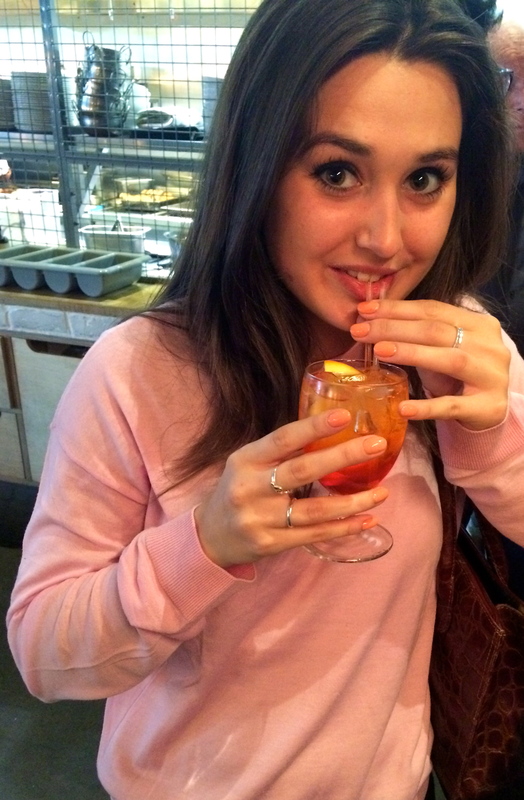 Turns out they do pretty good Aperol Spritz’ too! We were eventually led to our table, and began deciding over the extremely comprehensive menu. We eventually came to a decision and made our orders. 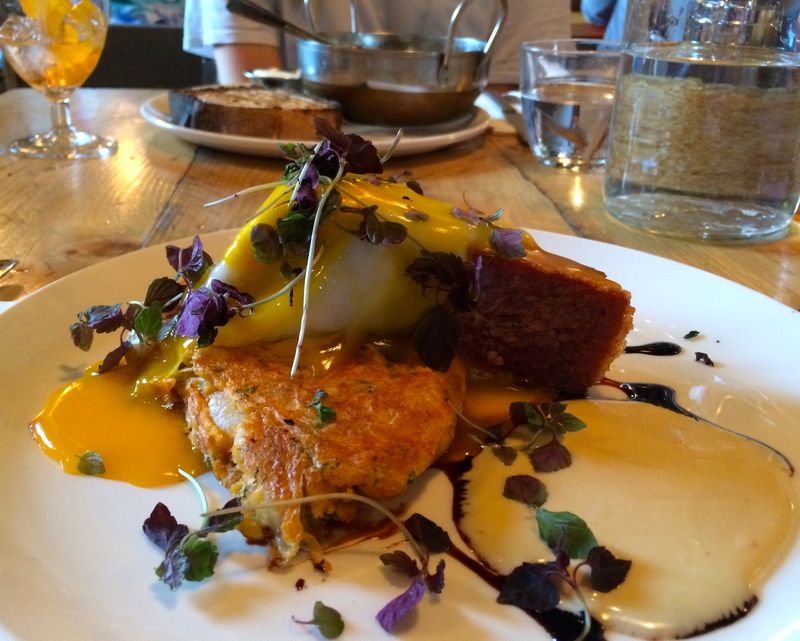 I went for the (slightly rogue) choice of Kimchi pancakes with crispy pork belly, fried duck egg and BBQ créme fraîche. 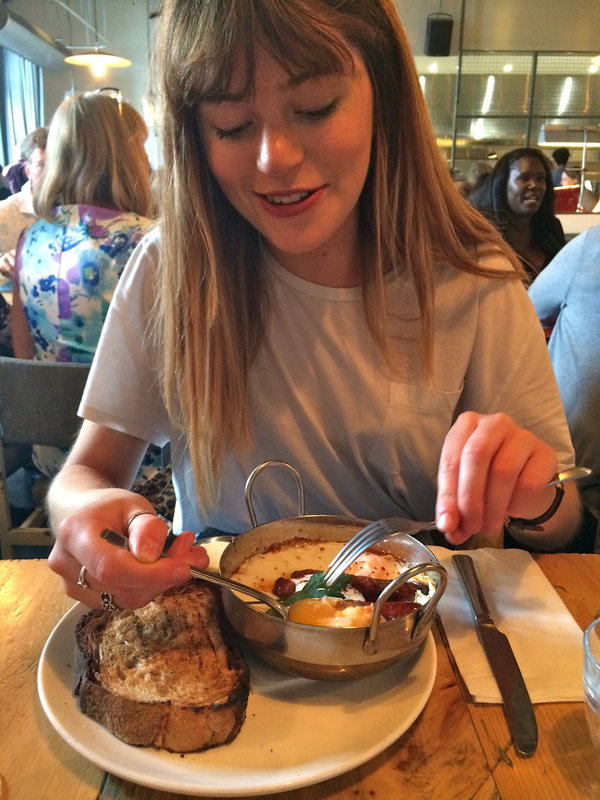 Becs went for baked eggs with tomato pepper ragout, greek yogurt, sourdough toast and merguez sausages. And my pork belly was the perfect amount of crispy which I was VERY happy about! Mine was delicious but incredibly rich- it finished me off for the entire day! It was a lovely unusual meal though, and refreshing to go somewhere that is being a bit more experimental with brunch. I definitely want to come back, and next time I’m going to try their pumpkin waffles! They had sold out this time sadly. The service was painfully slow, but the food and atmosphere made up for it. Go and give it a try!